"In 1826 empresario David G. Burnet received a grant from the Mexican government for colonization of the area that is now Anderson County. In 1833 members of the Pilgrim Predestinarian Regular Baptist Church settled at the site of Parker's Fort in Limestone County, and others settled near the site of present Elkhart, where they established "Old Pilgrim," reputedly the oldest Protestant church in Texas. "In response to a petition presented by settlers at and around Fort Houston, the First Legislature of the state of Texas formed Anderson County from Houston County on March 24, 1846. 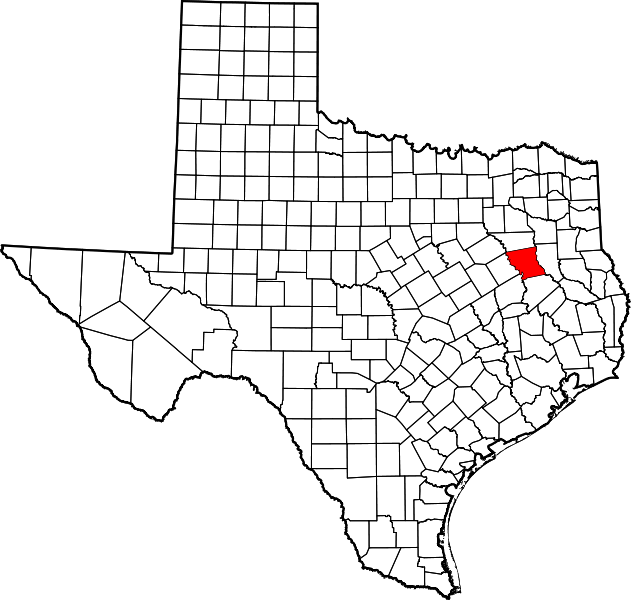 A suggestion was made that the new county be called Burnet in honor of David G. Burnet. The county was named Anderson, however, after Kenneth Lewis Anderson, a prominent member of Congress and the last vice president of the Republic of Texas. "... a committee, composed of Dan Lumpkin, William Turner Sadler, and John Parker was appointed to lay out the site for and name a new county seat. They chose a 100-acre tract in the center of the county. The Parkers had come from Palestine, Crawford County, Illinois, and upon their suggestion, the new county seat was named Palestine." I visited Anderson County and photographed the courthouse in Palestine on Saturday, March 24, 2012. "The Anderson County Courthouse, a Classical Revival Style temple built in 1914, is the visual focal point of the city of Palestine, Anderson County, Texas. The courthouse sits in the center of the courthouse square on a gently sloped hill. In plan, the courthouse is a bi-axial Beaux Arts arrange-ment with a rotunda. The building is three stories with a raised basement. It is finished in brick, stone and terra cotta. Visual dominance of the building is achieved through the overall height, contrasting colors, large raised porticos with giant Ionic columns and a silver painted dome. The building has had few alterations since its construction, retaining its architectural integrity and growing in symbolic importance.